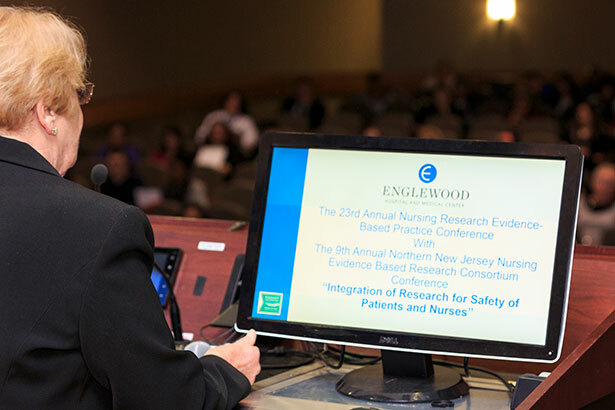 More than 130 nursing professionals gathered for the 23rd annual nursing research evidence-based practice conference focusing on patient and provider safety. In an effort to further prioritize patient safety and provider well-being, Englewood Hospital and Medical Center hosted the joint 23rd Annual Nursing Research Evidence-Based Practice Conference/9th Annual Northern New Jersey Nursing Evidence Based Research Consortium Conference, “Integration of Research for Safety of Patients and Nurses,” on Nov. 17. Program presenters from several organizations provided unique perspectives to the 130+ attendees, comprising nursing professionals from Englewood Hospital and Medical Center and consortium hospitals, nursing students, and other health care providers. Keynote speaker Dr. Patricia Dykes, an associate professor of medicine at Harvard Medical School, kicked off the morning with a presentation on evidence-based fall prevention. In the afternoon, Dr. Neal Wiggerman, specialist research scientist at Hill-Rom, spoke on patient positioning in bed and implications for patient and caregiver safety. Speakers from the Northern New Jersey Nursing Evidence-Based Research Consortium included Dr. Jill Cox from Englewood Hospital and Medical Center, Dr. Pam Pascarelli from Hackensack Meridian Health, Janet Pagulayan from St. Joseph’s Regional Medical Center, Nicole Reyes from Jersey City Medical Center – RWJBarnabas Health, Bonnie Weinberg from The Valley Hospital, and Oksana Yakoff from Holy Name Medical Center. Ramapo College of New Jersey is also a member of the consortium. Over the course of the day, discussion topics ranged from accompanying patients into the operating room, enhancing patient safety through accurate electronic weight, best practices to increase discharge of total joint replacement patients, using the teach-back method in discharge education, self-reported competence of entry-level registered nurses, and pressure injuries in the critically ill population. Learn more about nursing education and professional development at Englewood Hospital and Medical Center.